PLANET. Selects the planet that your satellite will orbit. This option sets the correct mass, spin rate, equatorial bulge, planet-Sun distance, and additional data appropriate for the planet you select. FREQUENCY. This number determines how often a point along the orbit is saved to disk. A larger number yields a more accurately drawn orbit at the expense of plotting time and disk space. You want to choose the largest number that yields a reasonably accurate orbit. Experiment! INTEGRATION LIMITS. These upper and lower limits on the planet-satellite distance allow you to stop the integration once the satellite has wandered into an uninteresting regime. Less than 1.0 planetary radii corresponds to a collision, while greater than several hundred to several thousand radii correspond to a satellite which escapes the planet. SOLAR GRAVITY. Choose to either include, approximate, or exclude the Sun's gravity. Here, as in all selections in this section, including an effect increases the run time of the simulation. PLANETARY SHAPE. A planet's shape determines its gravity field. Here you choose whether to approximate the planet by a sphere or by an oblate ellipsoid (a slightly squashed sphere) which is closer to reality. PLANET'S TILT. Here you set the tilt of the planet's spin axis to be zero or its actual value. This option is only important if solar gravity is included in the simulation. SHAPE OF PLANET'S ORBIT. Use a planet's true orbital shape or approximate it by a circular orbit? This option affects the strength of solar gravity and hence is only important if solar gravity is included. SEASON. This number determines how the planet's spin axis is initially oriented. A value of 90 means that the spin axis is pointed as close to the Sun as possible (summer in the northern hemisphere). This value is only important if the planet's spin axis is tilted. TRUE ANOMALY. This parameter specifies the angle between pericenter (the place along the planet's orbit where the planet-Sun distance is smallest) and the starting position of the planet along its orbit. Valid range is 0 to 360 degrees. This value is only important if the planet is on an eccentric orbit. INITIAL POSITION. The initial position needs to be specified in spherical coordinates where r is length of the radius vector, theta is the angle between the z-axis and the radius vector, and phi is measured from the x-axis to the projection of the radius vector into the xy plane (see figure). Valid Ranges: r (must be positive), theta (0-180 degrees), phi (0-360 degrees). INITIAL VELOCITY. The initial velocity is specified in a local coordinate system based on the particle's position. The velocities vr, vtheta, and vphi are in the directions that would cause r, theta, and phi to increase (see figure). Since the velocities are normalized to the circular velocity, when the total speed is 1.0, the satellite starts on an initially circular orbit around the planet. 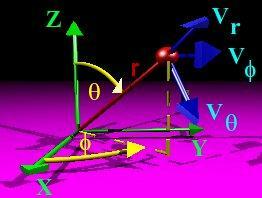 The total velocity squared is the sum of the squares of the three velocity components. LOAD DEFAULTS. Reset form entries to their default values.